The result? 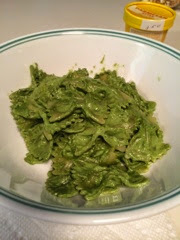 A frighteningly green but amazingly delicious pasta dish. 2 cups greens - kale, swiss chard, etc. Put all ingredients in food processor of blender and mix until creamy and smooth. Add almond milk as needed to create thinner consistency. Serve over pasta, on bread, or any other way you like to eat pesto. This was possibly the easiest recipe ever. We had to do some finagling to get the taste right. Depending on the greens you use, your sauce could taste too green. If you add too much garlic, the sauce can be overpowering. Add nutritional yeast at your own discretion, too. A little goes a long way, but if you like the flavor of it, by all means, add more. I've read that this recipe is good if you add vegan parmesan cheese into it, but I didn't have enough on hand to try it. But I did sprinkle some on top of my pasta and it definitely enhanced the flavor of the pesto. Overall, this was a quick and easy way to make up some fresh sauce and use up a lot of our greens. I'll definitely be making this again!